The waxing crescent moon shines in the vicinity of the Pleiades star cluster tonight. On the other hand, if you live in the eastern part of the globe –Asia, Indonesia, Australia, or New Zealand – you will see the moon closer to the Pleiades tomorrow night. On a dark night, most people see the Pleiades cluster as a tiny dipper-shaped formation made of six little starlets. That lost seventh star – the missing Pleiad – is the stuff of myth and legend. If the moonlight glares or light pollution makes it difficult to see the Pleiades tonight, try using binoculars. The Pleiades cluster readily fits within a binocular field of view. 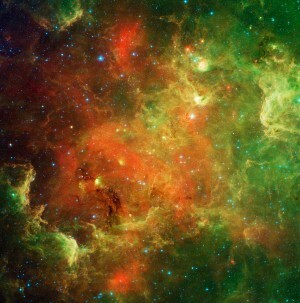 For reference, a typical binocular field covers about 5 degrees of sky. The Pleiades dipper is about one degree wide, and the moon measures about one-half degree in diameter. One star close to the Pleiades is Aldebaran, the brightest in the constellation Taurus the Bull. The Pleiades also belong to this constellation, marking Taurus the Bull’s shoulder. 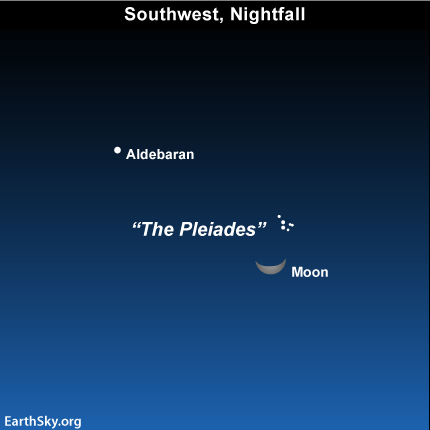 You can see the moon, the Pleiades, and Aldebaran from both the northern and southern hemispheres. The moon and Pleiades stay out until late night or close to midnight at mid-northern latitudes. At mid-southern latitudes – where you will see the moon and Taurus in your northwest evening sky – the moon and Pleiades stay out only until mid-evening. In both hemispheres, the moon and Pleiades will set in the west-northwest part of the sky.